British and Irish Lions coach Warren Gatland is to have surgery as a follow-up to the treatement already received after breaking his heels in April. The Lions say the surgery on Friday is to "an area of damaged and blistered skin" on his right heel is elective. 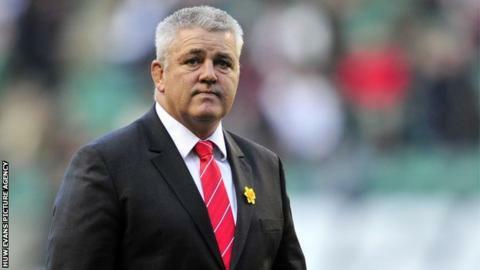 Gatland's appointment as Lions coach was delayed while his fitness to take charge of the tour was assessed. He will also guide Wales into their autumn Tests against New Zealand, on 24 November, and Australia on 1 December. Robert Howley stepped up from his assistant coach role to be Gatland's stand-in for the three-Test tour to Australia in June, 2012. He does likewise for the two Tests that kick off Wales' autumn campaign, against Argentina on 10 November and Samoa on 16 November. Gatland then resumes his Wales coaching role as they take on world champions New Zealand on 24 November, and the Wallabies on 1 December. Former Wales and Lions scrum-half Howley will then guide Wales into the defence of their Grand Slam and Six Nations titles, starting against Ireland at the Millennium Stadium on Saturday, 2 February.